If the battery is weak or if the engine is difficult to start, recharge the battery and perform inspections again before returning the vehicle to the customer. (a) Check the battery for damage or deformation. If severe damage, deformation or leakage is found, replace the battery. (b) Check the electrolyte level in each cell. If the electrolyte quantity is below the lower line, replace the battery. If the electrolyte quantity is above the lower line, check the battery voltage when cranking the engine. If the voltage is below 9.6 V, recharge or replace the battery. Before checking the battery voltage, turn off all the electrical systems (headlights, blower motor, rear defogger, etc.). (1) Turn the ignition switch off and turn on the headlights for 20 to 30 seconds. This will remove the surface charge from the battery. (2) Measure the battery voltage according to the value(s) in the table below. If the result is not as specified, recharge or replace the battery. (a) Check whether the battery terminals and engine wire harness are loose or corroded. (b) Measure the resistance of the fuses. If the result is not as specified, replace the fuse. (a) Visually check the generator wiring. (1) Check that the wiring is in good condition. (a) Listen for abnormal noises from the generator assembly. (1) Check that no abnormal noises are heard from the generator assembly while the engine is running. If noise occurs, refer to Problem Symptoms Table (See page ). (a) Turn the ignition switch to ON. Check that the charge warning light comes on. (b) Start the engine and check that the light goes off. If the light does not operate as specified, troubleshoot the charge warning light circuit. (a) Connect a voltmeter and an ammeter to the charging circuit as follows. If the battery/generator assembly tester is available, connect the tester to the charging circuit in accordance with the manufactures instruction. (1) Disconnect the wire from terminal B of the generator assembly and connect it to the negative (-) lead of an ammeter. (2) Connect an ammeter positive (+) lead to terminal B of the generator assembly. (3) Connect a voltmeter positive (+) lead to terminal B of the generator assembly. (4) Ground a voltmeter negative (-) lead. (b) Check the charging circuit. (1) Maintain the engine speed at 2000 rpm and check the readings on an ammeter and voltmeter. If the result is not as specified, repair or replace the generator assembly. (a) With the engine running at 2000 rpm, turn the high beam headlights on and turn the heater blower switch to the "HI" position. (b) Check the reading on an ammeter. 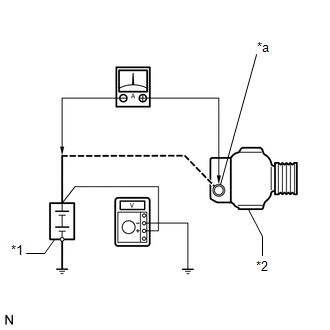 If an ammeter reading is not as specified, repair or replace the generator assembly. If the battery is fully charged, the reading will sometimes be less than the standard. If this is the case, add more electrical load (operate the wipers, rear window defogger, etc.) and check the reading on an ammeter again. (a) Check the harness and connector. (1) Disconnect the E9 ECM connector. (2) Disconnect the G2 generator assembly connector. (3) Measure the resistance according to the value(s) in the table below. If the result is not as specified, repair or replace the harness or connector.